Kat Barry & Company is dedicated to making real estate approachable and personal. We pride ourselves on service and often form lasting friendships with our clients and their families. We know how stressful real estate transactions can be and are here to guide you through it every step of the way. 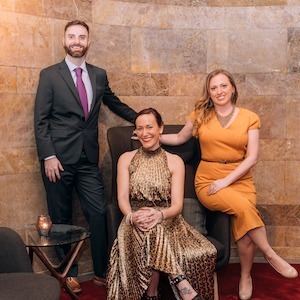 We are an inclusive group of real estate professionals with eclectic backgrounds and interests, but we all share a love of Chicago, travel, architecture, animals, and wine! Our team has a combined 25 years of experience and over 100 million in sales in multiple markets. More than our production though, we value our one-on-one relationships with our buyers, sellers, landlords and tenants. While we have a passion for a lot of Chicago neighborhoods, Kat specializes in Bucktown, Humboldt Park, Logan Square, Ukrainian Village, and West Town. Stuart is your go-to for Bronzeville, Hyde Park, Pilsen, South Loop, and the West Loop. Lisa has worked with our landlord and tenant clients in Avondale, Gold Coast, River North, Roscoe Village, Uptown, West Town, Wicker Park, and the Western Suburbs. Kat Barry & Company has worked with people from all over the world. Team leader Kat has earned the At Home with Diversity certification from the National Association of Realtors and is a Certified International Property Specialist. We joined COMPASS because we love what their innovative marketing strategies and cutting edge technology allow us to do for our clients. Learn more about us individually by clicking on our bios below.